A leading Australian chiropractor has warned that ‘text neck’ which is a condition often brought on by bending over phone and tablets for several hours at a time is becoming a global epidemic. Dr James Carter who is based in in NSW in Australia warns that the condition can lead to anxiety and depression as well as spinal damage. The condition, which is a relatively new one, is becoming widespread and with an alarming increase in the number patients over the last few years, at least 50 percent of them are teenagers of school age. Shocking x ray pictures featured in the Daily Mail report show teenagers and children as young as seven who have developed abnormally curved spines and are developing hunchbacks because of their addiction to smartphones. ‘I have started seeing lots of cases over the past two years, especially in young schoolchildren and teenagers,’ Dr Carter was reported to have said. ‘The condition is called ‘text neck’ because it is often caused when people sit with their heads dropped forward looking at their devices for several hours at a time. It’s not just the neck and spine that gets affected. The condition can also result in emotional and behavioural changes as the stress can affect the release of ‘happy hormones’. Dr Carter also advised avoiding using laptops or phones while sitting or lying in bed, raising monitors or devices to eye level and keeping your body moving. 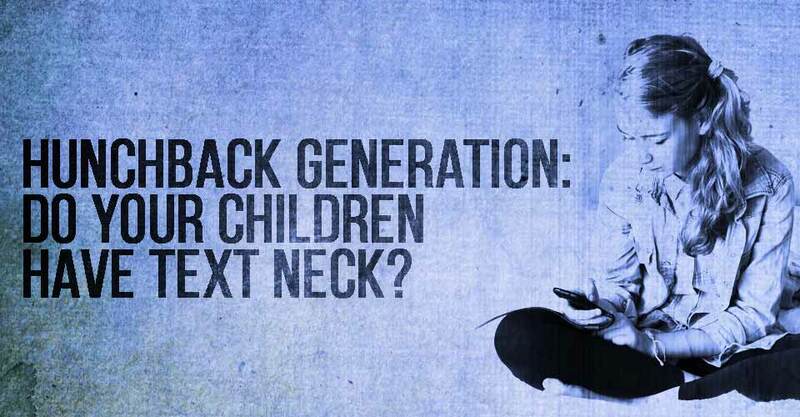 Sammy Margo, from the UK’s Chartered Society of Physiotherapy, also believes that ‘text neck’ is on the rise. She said the condition can cause ‘head pain, neck pain, arm pain and numbness’. I shiver, because as I write this my three and half year old son is watching monster trucks on the phone, its the only way I can get thirty minutes peace to do my work. In an age when smartphones seem to have taken over our lives and toddlers can operate smartphones as well as adults, the way children entertain themselves have increasingly become screen orientated as adults try to fit in all the tasks they need to do in their busy lives. Surely it can’t be all doom and gloom, there must be a way to counteract it? Its reported that the posture we adopt as we stare at our phones causes excessive wear and tear that may eventually require an operation to correct it. Dr. Carter, the former governor of the Australian Spinal Research Foundation, has explained that even though the spine can shift by up to 4cm after repeated head tilts he believes damage can be minimised for teenagers through regular exercise and a natural, ‘healthy lifestyle’. Below is a video we found on youtube on how to minimise the effects of text neck. But lets keep an eye on our loved ones and ourselves. Get outside, exercise, run and stretch as much as we can before the upcoming generations become considerably shorter.